Introduction: Ross Reels and Ross Outdoors celebrates 35 years of business with the release of an exclusive limited edition series of their premium Vexsis reels in a distinctive 3D tie-dye pattern. In addition, the company also announces the release of a limited run of 200 "Reel in a Cure" Pink Fly Fishing Outfits to help fight Cancer. Ross Limited Edition Tie Dye Vexsis: In celebration of their 35th. 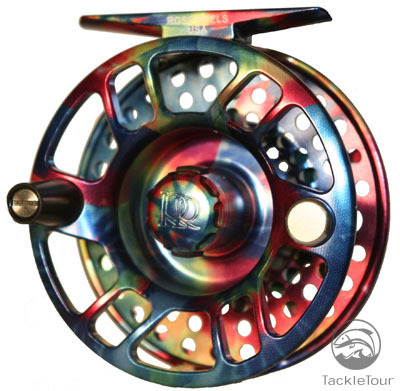 Anniversary, Ross will soon be releasing a limited edition series of their Vexsis reels in a 3-D tie dye pattern. Each limited edition reel will be custom engraved with a limited edition number and only 175 of these reels will be manufactured. They are available on a first-come, first-served basis and can be purchased from any authorized Ross dealer, while supplies last. The Vexsis fly reel series is loaded with the latest Ross features and innovative engineering. The Vexsis's drag system is based on the Ross Momentum's carbon fiber design and the company has modified the system by adding in ceramic to enhance the overall performance. The addition of ceramic promotes strength in the overall design by providing a surface that is highly heat resistant. These limited edition reels will become available on June 1st, 2009. "Reel in a Cure" Outfits: Breast cancer is a disease that has touched every person in some way and Ross Reels USA/Ross Worldwide Outdoors is committed to doing its part to raise awareness and help find a cure. This disease hit very close to home when Susie Hauck, co-founder of Ross Reels USA / Ross Worldwide Outdoors, in 2002 lost her nine year battle with breast cancer. The Ross family carries on her mission to find a cure for breast cancer, and in honor of Susie�s unbelievable spirit and passion for life, each year Ross produces a special edition series under the �Reel in a Cure� name. Proceeds from this series will go to support the Susan G. Komen Breast Cancer Foundation in their fight to eradicate breast cancer as a life threatening disease. This year�s series is a limited run of 200 �Reel in a Cure� Pink Fly Fishing Outfits. Included in this outfit are the following �Komen Pink� items: Airius #2 fly reel engraved with the Komen Ribbon, Essence FW 586-4 Fly Rod, and a special Rod/Reel case. These outfits can be purchased from any authorized Ross dealer and the retail price for these outfits will be $399.00. This is an incredible value; with savings of more than 25% if these items were purchased separately, and only 200 total units will be made. Ross will donate $10,000 to the Susan G. Komen Breast Cancer Foundation from the sale of these outfits. Additionally, individual outfits will be donated to the International Women Flyfishers, The Pink Tie Affair / Race for the Cure (fundraisers for the Komen Foundation), Casting for Recovery and Reel Recovery to help raise money for these outstanding organizations. These outfits will be available June 1st, 2009. Ross adds 12wt. Rods to the Essence Series of Fly Rods: Sure to please entry level fly fishermen, Ross is also announcing the addition of a new 1290-4 rod in each of the three Essence series... FS, FC and FW. All three series are manufactured with a �Ross Exclusive� proprietary graphite design to be smooth casting, sensitive and precise. The Essence series fly rods are designed to carry line effortlessly when casting in close, or reaching out to far away targets. The Essence series fly rods have been assigned graphite designations of R-1, R-2 and R-3 to highlight design differences. While the fundamentals of each series remain true to the design, a higher numbered R-Value indicates a slightly more progressive action. All three of these offerings are 4-piece rods that will ship complete with a rod sock and rod case. The Essence fly rods are all affordably priced (119-229 dollars) yet offer plenty of the features Ross is known for all in a reasonably priced package. The new fly rod models, like the other products, will become available June 1, 2009. Looking for Ross products? Check out FishUSA.